My Name is Peter..... I like unicorns. 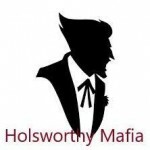 My contact is: p.griffoen@holsworthymafia.com if you want to get in touch. ‘Taken’ 4 to start filming in Holsworthy. The Holsworthy Mafia guide to slagging a local business off, on Facebook. Original Poundland Factory Bargain buy shop shop, set to open tomorrow. Chris Martin and Coldplay are ultimately to blame for Brexit. Mayor of Bude accused of wildlife smuggling. 2018 A year in the life of Holsworthy (Mafia style). Devon County Council donates open air swimming pool to Holsworthy for Christmas. Holsworthys ugliest building is sold, and to be shipped brick by brick to Bude. Stalls return to Holsworthy Market. 5 Reasons why Holsworthy is the greatest place on earth. We ‘Anger Translate’ the Mayors statement on the Factory Shop.